Stacy Tilton Reviews: Real food..for real pets! What does that mean "Real food..for real pets!" you ask? Well I'll explain it to you. It means serving up fresh (and real) foods to our pets instead of something that comes in hard pieces in a big bulk bag. I mean our pets are read right? They live and breath just like we do, so why not give them the same nutrition we give to ourselves. With a little help from Freshpet® you can do just that, and quite simply I might add. Freshpet® is the first company to install fridge’s in the pet food aisle to house their fresh foods for pets. They care that much about our beloved furry friends they want to make it as simple as possible for us to provide them with the natural nutrition the need..and deserve. In preparation for Cat Day on September 29 Freshpet® is going above and beyond by showing the love for our feline companions in a big way: they are helping cat shelters across numerous states with special cooler bags and more! Now that to me says alot about the company and how much they care! I know our cats and the dog have always gotten more excited about me opening a can of wet food for them then when I dump some hard kibble into their bowls. I guess I should have taken that as a hint as to what they really wanted to eat all the time. FRESH food not something hard from a bag that's been sitting for possibly months on a shelf. I mean wouldn't you rather eat something that's soft, moist and fresh? Unlike traditional dry cat food, every Freshpet® recipe starts with moisture rich, high quality poultry, meat or fish which helps provide cats the natural hydration they need. Cat’s tend to have a natural low-level thirst drive and Freshpet® products were made to retain high levels of moisture and provide natural hydration. All the healthy, protein-rich Freshpet® cat meals are grain free and made in the USA using only the highest quality natural ingredients. Freshpet® believes all pets deserve to benefit from eating fresher, less processed foods just like we do to stay healthy. We know a growing number of consumers are making their own dog food. However, it may not have the right balance of protein and nutrition for their dogs. This is why Vital® hand-crafted Fresh Cuts™. It provides the goodness of a home cooked meal with a medley of shredded chicken, antioxidant-rich cranberries, and vegetables like sweet potatoes and green beans for the optimal mix of protein and nutrition. Freshpet®, headquartered in Secaucus, New Jersey, is the only company providing fresh, all-natural dog and cat food nationwide. 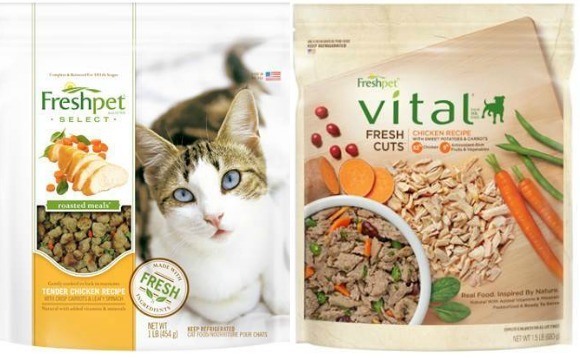 Founded in 2006 by pet lovers and pet food industry professionals, Freshpet® identified an opportunity to improve the pet food market and introduced fresh dog and cat food as a healthy alternative to dry and canned food. Freshpet® only uses the highest quality meats, poultry and fish combined with fresh vegetables and fruits—with never any byproducts, fillers or pre-processed meats like those found in traditional dog food. Nutrient rich recipes allow pets to have the same healthy eating habits as their owners. Freshpet® foods are available at Pet Specialty retailers and local independent stores.